See the International Space Station live from your location! 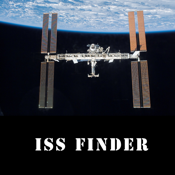 iSSFinder shows you the next upcoming sightings of the ISS on your location. You can see the ISS with your eyes in cities or countryside if you know when it will come. Special thanks goes to Christopher Peat from Heavens-Above Gmbh and to Yahoo for the weather informations. All informations also available for free and direct from the sources! Works only on iPhone or iPad with GPS!